Picture: Kruispoort with Bonne Chiere mill on the background . Bruges' remaining four town gates were a part of the second defensive walls that were built at the end of the 13th century. After the defeat of the Flemish armies against the French crown (battle of the Pelevenberg), the French king in 1305 ordered that the gates had to be torn down so that the town would not be able to defend itself anymore (treaty of Athis-sur-Orge). However, in the course of the same century the defenses were rebuilt and continuously improved. The gates on the eastern side (the Kruispoort and the Gentpoort) were more robustly built than the ones on the western side because the eastern side was more vulnerable for attack from outside. In 1782, emperor Joseph II ordered that the town walls had to be sold (with the goal that they would be demolished), however, several gates were spared in Bruges. Ezelpoort. In its present state, this gate dates back to 1369. 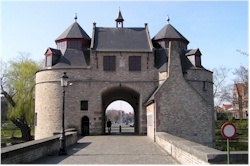 The first Ezelpoort (Donkey Gate) was built during the construction of the second defensive girdle at the end of the 13th century. This gate is a so-called watergate, which means it is built on an embankment in the canal. It can be reached via a brigde on both sides. It consists of two massive round towers connected via a rectangular middle part. The triangular fronton on the outside and the gatekeeper's house have been added to it more recently. Gentpoort. This gate is located on the old road to Ghent, from which is derived its name. It was built in the beginning of the 15th century on the same location of a previous gate that was erected at the end of the 13th century. Originally, the gate complex was much bigger. Like the Kruispoort, the Gentpoort also had an additional frontgate that was situated on a separate embankment and that could be reached via drawbridges. To make the canal more suitable for shipping, it had to be widened. This also meant that the frontgate had to be torn down (middle of the 18th century). Sidestory: bailiff Pieter Lanchals governed Bruges in the name of emperor Maximilian of Austria untill his death in 1488. During an insurrection of the towns against Maximilian, he was captured and tried. Found guilty, he was condemned to death. His head was placed on a spike at the Gentpoort and his body burried in the church or Our Lady. Kruispoort. 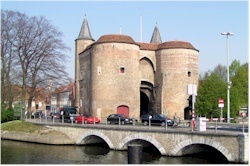 In its current condition, this gate dates back to the start of the 15th century (begin construction in 1401), the same time that also the Gentpoort and the former Katelijnepoort were being built. During its lifespan the gate has had quite a bit of alterations. Originally, the complex was much bigger, consisting of the preserved main gate and a frontgate which was built on a central embankment. The ensemble had eight towers, two brigdes and a stone wall that passed into the earth rampart was built adjacent to the main gate to provide additional protection. The gate could be sealed off by means of a portcullis and drawbridge. Nowadays, only the main gate remains but it still is an impressive sight to see. The name of the Kruispoort, refers to the community of Sint-Kruis, located just on the other side of the canal. Smedenpoort. This gate shows many similarities with another surviving gate: the Ezelpoort. They were both built in the same period (Smedenpoort in 1368). A new upper part was added to the gate in 1615. In 1944, the building was severely damaged by an explosion. In 1948 it received an intensive restoration. In 2009, the gate was brushed up and painted in ochre. It's name is derived from the Smedenstraat, which means street of the (black)smiths. Dampoort. Althought the Dampoort doesn't exist anymore (demolished in 1871), it is worthwhile mentioning because it was the largest bulwark in medieval Bruges. 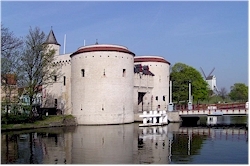 The Dampoort was actually a complex of no less than three gates that were interconnected: the Speipoort, the Sint-Niklaaspoort and the Sint-Lenaartspoort. It was no surprise that this massive defensive stronghold was built here since this was the place where ships entered the town. The complex was not only of military importance but also had an important commercial role. A part of one of the round towers is the only visible remainder of this once impressive structure.